The most important part of any pixel style is the color choice. Time Fantasy graphics have a specific “feel” to the colors. But the colors themselves follow no specific rules: color choice is about using your eyes. Aim for a SNES-era tone or suggestion via style and not color limitation. Use it as inspiration rather than as an arbitrary restriction. I believe that having a loose and flexible color palette will make it easier for other people to create their own graphics in the style of Time Fantasy. 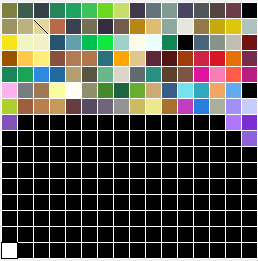 I use GraphicsGale for my pixel art, so I’ve gone ahead and exported the palette from my working document for the Time Fantasy character sprites. Should work in GG, and other programs might be able to use it too. It’s messy and not particularly organized for other peoples’ use. If I were a purist then this would be a lot less colors. But instead I focused on the piece itself instead of worrying about color count. This palette was just something that naturally developed as I made the colors that I needed. It’s a living thing. I continue to add colors and tweak them. But you might find it useful starting point. You don’t HAVE to use this exact color palette. For all the talk about it being “16bit” or “SNES”, the TF style does not adhere to rigid color limitations. You’ll notice that the darkest “black” on the sprite shadows/outlines is very far from being pure black (RGB: 53/64/73). Avoid pure white. Instead use a very light blue (RGB: 236/254/252) or yellow (RGB: 251, 251, 232). Some colors in this palette are very similar to others (lots of blue-grays, for example). When creating a sprite or a tile, choose one and stick with it. Try not to use two colors that are too similar in the same piece. Avoid using colors with too little contrast. There are a few different “blacks” on the palette above. I used them in different ways: for example one tileset uses a darker black than another. It’s about setting the right tone for the piece or area. But BE CAREFUL about using multiple “black” shades in a single object. When coloring, use or create a color ramp that builds towards (or from) your chosen “black” for that piece. Just a reminder to avoid things like photoshop soft brush tools or automatic anti-aliasing and stuff. They’ll create a bunch of extra colors that will look out of place. Here’s an example of some color ramps that I used when making the TF character sets. Take two colors to be the ends: in each example here, the ramps begin and end on the same “white” and “black”. Don’t be afraid to wiggle a little with colors when you are trying to shade some kind of material. The bottom two colors are noticeably darker and have less contrast between them. This is because they were both used together to create “soft” outlines on characters. 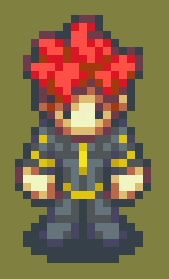 The pixels around this character’s hair, for example, show how I’d use those colors to retain an outline while accentuating the form of the cluster. Try to steer your ramps in the direction of existing colors. Darks tend to shift purple and lose saturation. Lights will shift either yellow or blue depending on material or tone. Of course, make exceptions when necessary for material, lighting or effects.